“Eighteenth-century humanism promoted a set of classical stories as models of artistic creation and prototypes fo artist’s self-identification. Retellings of the legendary stories of Zeuxis, Pygmalion, Apelles do not simply reveal the infrastructure of the creative act but define it in clearly gendered terms. Within these antique discourses, eighteenth-century artists could, and often did, reaffirm the status of the man as artist/subject and the woman as model/object. Facing such mythologies, a female artist confronted a problem of identification. By identifying too closely with the male artist and his creative potential, she ran the risk of denying what was perhaps her most important attribute, her gender, and therefore opening herself to attack for being sexually transgressive. But identification with the passive female model would seem to deny the woman artist her status as agent. It is the apparent impossibility of escaping this impasse that makes Kauffman’s painting so remarkable. Rosenthal, Angela. 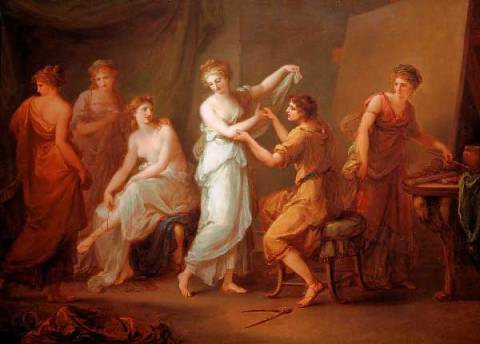 Angelica Kauffmann: Art and Sensibility (New Haven, CT and London: Yale University Press, 2006), p. 4.